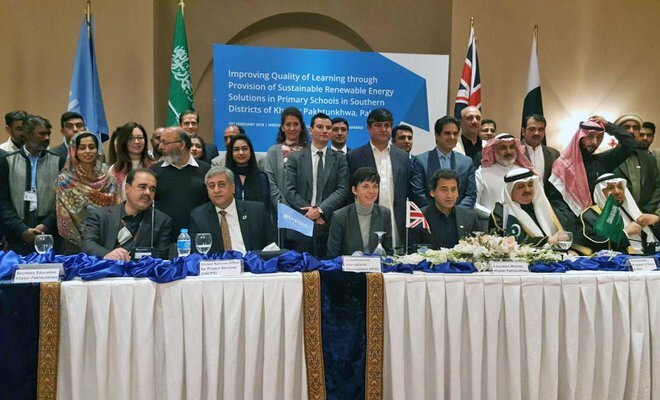 The Saudi Fund for Development (SFD) and the UK’s Department for International Development (DFID) on Tuesday announced an agreement to provide solar panels for schools in Pakistan’s northwest province of Khyber Pakhtunkhwa (KP). The agreement, which will provide energy for primary schools in KP’s southern districts, was signed in Islamabad with the UN Office for Project Services (UNOPS). Over the next two years, UNOPS will implement the project on behalf of KP’s government, with £6.5 million ($9 million) of funding jointly committed by the DFID and SFD. The grant will cover nearly 2,000 government schools in seven districts in KP: Bannu, D.I. Khan, Karak, Kohat, Lakki Marwat, Tank and Hangu. Of these, more than 700 are girls’ schools with more than 81,000 students already enrolled, the British High Commission said. The Saudi ambassador to Pakistan, Nawaf Saeed Ahmad Al-Maliki, said at the signing ceremony that the project will be extended. He is looking forward to working closely with Pakistan and investing in the country, he added. In his address, SFD head Yousef Ibrahim Al-Bassam said the project will be a turning point in the implementation of large-scale renewable energy projects. “It will empower the students, provide them with opportunities and lead the province to economic and social development,” he added. Al-Bassam said he is delighted to launch the project in collaboration with the DFID. He thanked UNOPS and KP’s government for their continuous support and cooperation in its implementation. In his speech, KP’s Education Minister Mohammed Atif Khan lauded the SFD’s involvement and contribution, and expressed hope that it will further cement the brotherly relations between Pakistan and Saudi Arabia. Lack of basic facilities in government schools in Pakistan is one of the main reasons for low enrolment and high dropout rates. The problem can be particularly acute in remote areas. With the DFID and SFD funding the provision of solar panels in these schools, KP’s government can focus its funding on other facilities, the British High Commission said. While addressing the signing ceremony, DFID head Joanna Reid expressed confidence that providing electricity in schools in KP’s southern districts will improve enrolment rates and education quality.